Credit: PO.DAAC. Download this movie (MP4, 14.7 MB). [13-May-14] This visualization shows the progression of improved data resolution from satellite altimeters in the past, present, and future, beginning with 1.5-degree resolution data in 1978 from Seasat and ending with 0.05-degree resolution data from NASA's Surface Water and Ocean Topography (SWOT) mission, planned to launch in 2021. 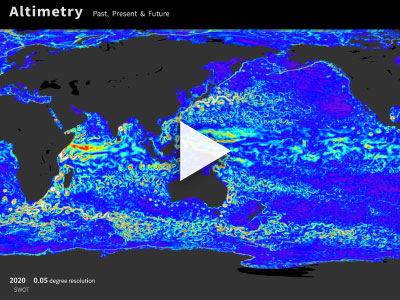 SWOT (with 0.05-degree-resolution) will offer an unprecedented combination of spatial and temporal resolution while continuing and extending the ocean altimeter data record for years to come.